Naveen patnaik and Rahul Gandhi are the two sides of a coin. 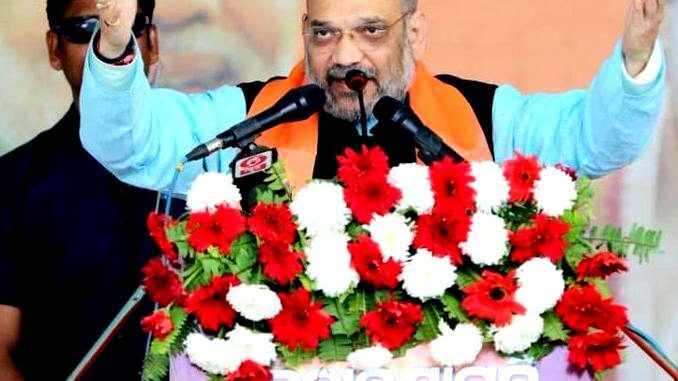 “When there raises the question on the safety of Ratna Bhandar, the question is on the wealth of Odisha, on the prosperity of Odisha,” said Amit Shaha at Kulia on Tuesday. This remark of the BJP president came a week after Odisha CM Naveen Patnaik had linked his ambitious KALIA -Yojana with Lord Jagannath. He Said the Modi government in the Center has sanctioned Rs 5,13,000 crore to Odisha but they are not reaching to the people because the Naveen government does not want development of Odisha; fearing Modi could become popular in Odisha, Naveen government is blocking welfare schemes of the central government. He gave reference of the Ayushman Scheme- the free medical treatment scheme targeted to cover 50 crore people in India that the Naveen government has refused to link to with. As an obvious answer to Naveen’s allegation of central neglect and the recent Rs 6400crore-center’s due to Odisha, Amit Shaha said that under Modi government the Center, through the 14th Finance Commission, has released Rs 2, 11, 510 crore for Odisha which -as Shaha said- was only Rs 79000 crore during the last five years of the UPA government of Rahul Gandhi. He added up other central sanctions during the Modi regime to Odisha counting it to Rs5, 13,000crore and asserted that development of Odisha is possible only with the BJP government. “Both Rahul Gandhi and Naveen Patnaik are two sides of a single coin,” he said. Naveen Patnaik got 19 years of power in Odisha, and the congress party ruled over Odisha for a long time but Odisha is still remaining as a poor state, Shaha remarked and he called for the next five- year term for the BJP government in the Center and in Bhubaneswar to make the “New Odisha”.